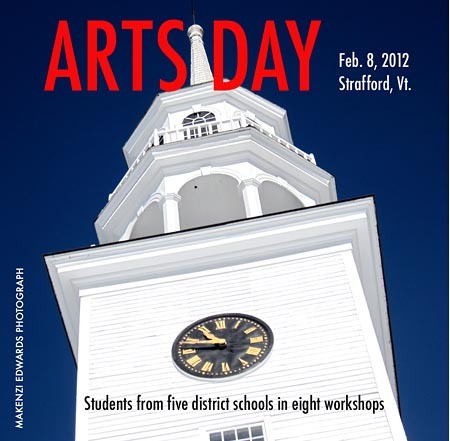 Last week, I was honored to be a part of Arts Day, a new district-wide gathering of students from five schools to work with artists in Strafford, Vt. The kids participated in eight workshops in calligraphy, painting, sculpture, felting and photography. My part was to work with ten students (including my daughter) as they photographed the day’s activities with their cameras. Above, my students are shown documenting the other photography workshop taught by Amy Donohue. I am working on a slideshow of the students’ photographs to give away (the cover is below). Contact me if you’d like a copy.